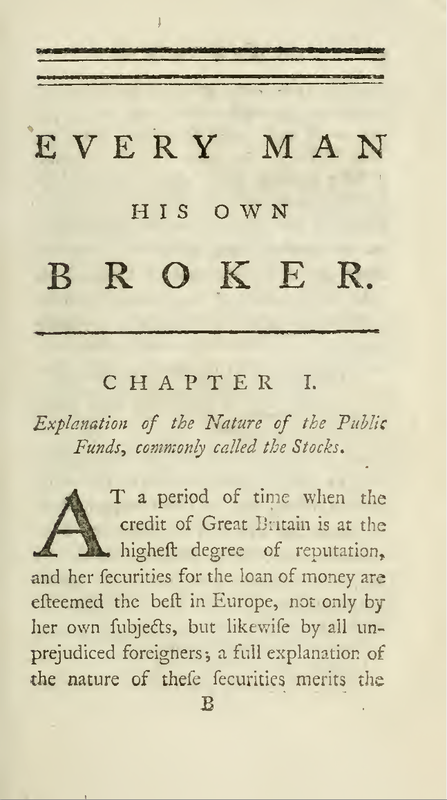 Every Man His Own Broker - IFA Vintage and Current Book Library - Index Fund Advisors, Inc.
Every Man His Own Broker book, published 1775, contains the first usage of the words: Bull and Bear as types of investors. Written by Thomas Mortimer, published by S. Hooper in London. The words Bulls and Bears are mentioned several times throughout the book, including the Preface. This book has some great quotes. 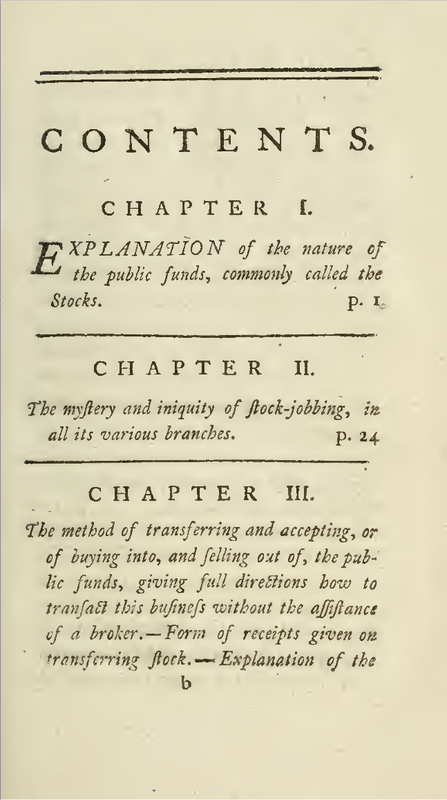 In the Preface he talks about the "Act for the better preventing the infamous practice of Stock-jobbing; by which the most palpable and glaring frauds then in vogue, were indeed suppressed: the Bubles burse, and the Racehorses of Exchange Alley, expired with the date of that act; but BULLS and BEARS still exist in full vigour." Mortimer, Thomas [1730-1810]. Every Man His Own Broker: Or, A Guide to Exchange-Alley. In Which the Nature of Several Funds, Vulgarly Called the Stocks, Is Clearly Explained. And the Mystery and Iniquity of Stock-Jobbing is Laid Before the Public in a New and Impartial Light. 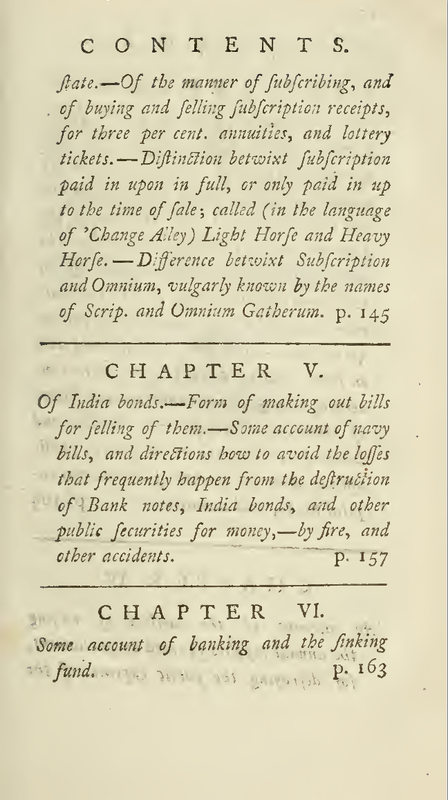 Also, The Method of Transferring Stock, And of Buying and Selling the Several Government Securities, Without the Assistance of a Broker, Is Made Intelligible to the Meanest Capacity: And an Account is Given of the Laws in Force Relative to Brokers, Clerks of the Bank, & Company. To Which is Added, New Tables of Interest on India Bonds, Calculated at 5 per Cent.--Directions How to Avoid the Losses That are Frequently Sustained by the Destruction of Bank Notes, India Bonds, & Company. By Fires and Other Accidents. 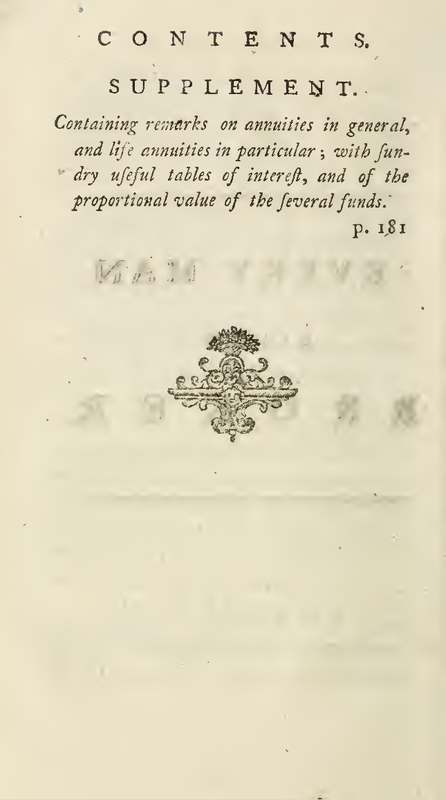 And an Appendix, Giving Some Account of Banking, And of the Sinking Fund--With a Copper-plate Table, Shewing the Intrinsic Value of the Several Funds, and the Proportion They Bear to Each Other, By Which Any Person May Immediately Know Which is Cheapest to Purchase. London: Printed for GS. Hooper, 1761. Fourth edition. xxviii, 174,  pp. Fold-out table (of interest rates). Includes two-page publisher advertisement. [Bound After] [Saint-Sauveur, Remond de (1728-1792)]. 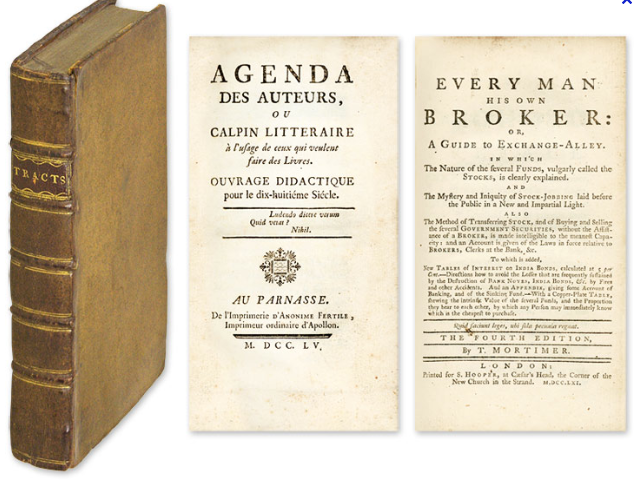 Agenda des Auteurs, Ou Calpin Litteraire a l'Usage de Ceux qui Veulent Faire des Livres. Ouvrage Didactique Pour le Dix-Huitieme Siecle. Au Parnasse[i.e. Paris]: De l'Imprimerie d'Anonime Fertile, Imprimeur Ordinaire d'Apollon, 1750. Octavo (6-1/2" x 4"). Contemporary calf, lettering piece and gilt-edged raised bands to spine. Light rubbing to extremities, small scuff to rear board, rear joints just starting at ends. A near fine copy. * Fourth edition (Mortimer); only edition (Saint-Sauveur). 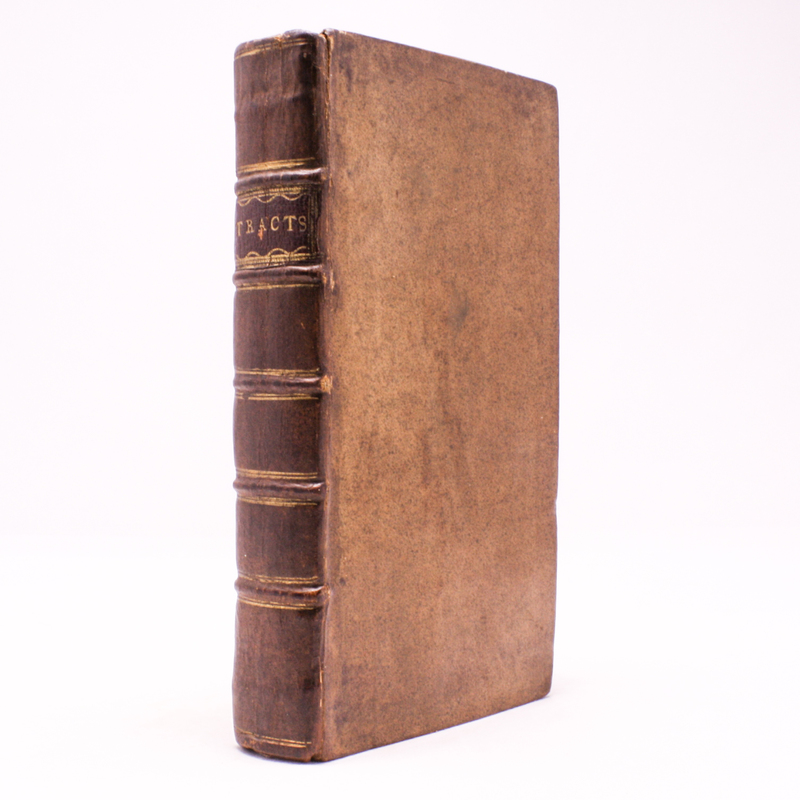 Mortimer's popular guide was first published in 1761 and was later translated into German, Dutch, French and Italian. It appeared at a time when Great Britain was codifying its position as the most sophisticated commercial empire in the world. At the time of the eleventh edition stock in the East India Company held an allure comparable to shares in internet start-ups in the mid-1990s. As his lengthy sub-title title suggests, Mortimer was critical of brokers and hostile toward speculation.